Alexx Robles attended the University of California, Los Angeles, and majored in Environmental Studies with a minor in Geology. When not whale watching or teaching classes at Birch Aquarium, she likes to spend her time surfing, practicing yoga, or hiking. This post celebrates our Birch Aquarium Volunteers for National Volunteer Week! 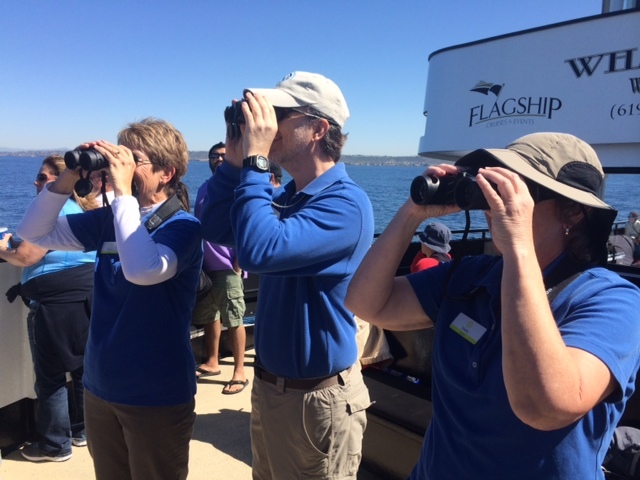 This past week aboard the Marietta we’ve gotten the chance to see several more gray whale sightings along with playful dolphins, breaching humpbacks, fin whales, lounging sea lions, and birds enjoying the pacific flyway migration route. This year we have seen exceptionally high numbers and more whales at this point in the season than this point in the season last year. 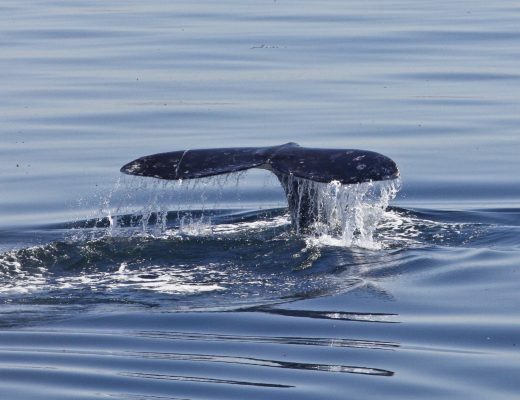 Whenever a whale is spotted the naturalist on board is able to announce the direction of the whale and give some facts about what is being observed. While the naturalist is busy sharing information from the wheel house down below several volunteers are hard at work making sure the guests questions are answered and that the are observing all that is happening in the water. Birch Aquarium Whale Watching volunteers Sharon, Wes, and Shelly. Thank you for all your hard work! Wes Holland’s favorite memory doesn’t involve whales but instead dolphins. It was about three years ago when he was able to observe three Rizzo dolphins in the wild. Holland, a docent who has been volunteering on the boat since 2008, loves dolphins and has noticed over his seasons of whale watching a decline in large megapods of dolphins. 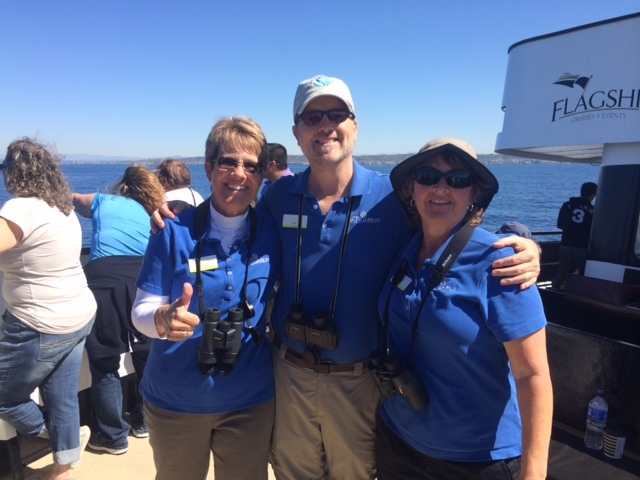 Sharon, Wes, and Shelly working hard to help find whales! Volunteers are a very important piece to whale watching season and add invaluably to the guest experience. More information about volunteering at Birch can be found here.